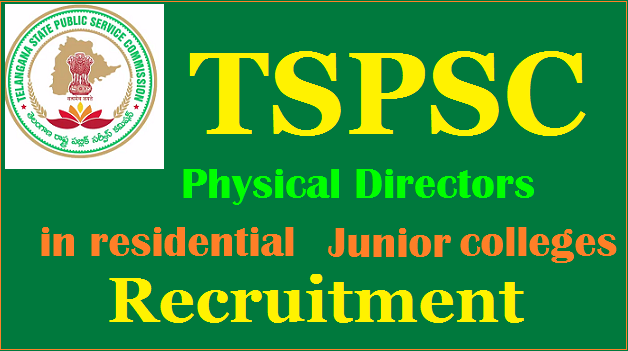 TSPSC PDs/Physical Directors in Residential Junior Colleges 2017 Recruitment Notification| Online Applications @tspsc.gov.in TS Gurukulam jobs notification 2017, TSPSC Gurukul PDs/Physical Directors Posts Recruitment Notification No. 26/2017 Released on 02-06-2017 , Government of Telangana has decided to Direct Recruit the vacancy position in all Residential Educational Institutions Societies through TSPSC. TSPSC PDs/Physical Directors in Recruitment in Residential Junior Colleges 2017, Telangana State Public Service Commission Physical Directors Recruitment 2017, Government of Telangana has decided to Direct Recruit the vacancy position in all Residential Educational Institutions Societies through TSPSC. TSPSC has released the post Graduate Teachers Recruitment 2017 for filling up the Gurukulams PD posts/ Gurukulam Teacher posts under various Residential Educational Institutions (social welfare, TREIS, BC welfare, Tribal welfare, Minority welfare residential Residential Junior Colleges ) in Telangana State. Online applications are invited from the eligible and interested candidates through Online mode at TSPSC Website. Telangana Gurukulam PDs Online application form, Last date for apply, PDs Exam date, Hall tickets, Results, Certificates verification, Eligibility Criteria, Exam pattern, Syllabus, application fee and more details are available here. Telangana State Public Service Commission( TSPSC) has released the Teachers,Non teaching posts Recruitment 2017 on 02/06/2017 for filling up the Gurukulams various posts/ Gurukulam Teacher posts under various Residential Educational Institutions Society (TSWREIS, TREIS, MJPTBCWREIS, TTWREIS, TMREIS) in Telangana State. Online applications are invited from the eligible and interested candidates for the recruitment of Gurukulam Posts in Telangana Residential Educational Institutions Societies through Online mode. The question paper of Preliminary (Screening Test) and Main examination will be supplied in English version only except languages. Sl. No. Name of the Post No. ofVacancies Age as on01/07/2017 Min. Max. Scale of Pay Rs. 1 Physical Director (Junior Colleges) in Mahatama Jothiba Phule Telangana Backward Classes Welfare Residential Educational Institutions Society. A Bachelor of Physical Education(BPED) OR Bachelor of Physical Education (BPE) ORBachelor of Science(B.Sc) in Health and Physical Education and Degree in Sports with atleast 55% marks, as per National Council for Teacher Education (Recognition Norms and Procedure) Regulations, 2009. In case of SC/ST/BC/ Differently abled candidates, the minimum marks shall be 50%. OR Atleast 50% marks in the B.P.Ed Degree/B.P.Ed(Integrated) 4 years professional Degree in accordance with the National Council for Teacher Education (Recognitions Norms and Procedure) Regulations, 2007 notified on 10/02/2007. In case of SC/ST/BC/ Differently abled candidates, the minimum marks shall be 45%. OR B.P.Ed with atleast 55% marks or B.P.E course( or its equivalent) of 3 years duration with atleast 50% marks in accordance with the National Council for Teacher Education Regulations, 2002 notified on 13/11/2002. In case of SC/ST/BC/ Differently abled candidates for B.P.Ed, the minimum marks shall be 50% or for B.P.E Course, the minimum marks shall be 45%. AND M.P.Ed., of at least 2 years duration from any National Council for Teachers Education recognized institution.